Join us for two full days of quad instruction in Denmark on September 8-9, 2018... We'll be covering everything from absolute basics (pure beginner) all the way up through advanced techniques and team flying, as well as providing short flight routines that are sure to help your skills along while having fun at the same time. I had no intention to miss out on this quad clinic as I did on the previous one in Denmark. Nonetheless I believe it was a boost for my QLK-skills then anyhow since I was determined to compensate for the missed training event. This time however I'll use the prior practice time to be prepared so that I can get as much as possible out of the (real) clinic. 3 spots gone, 12 left. 4 spots gone, 11 left! 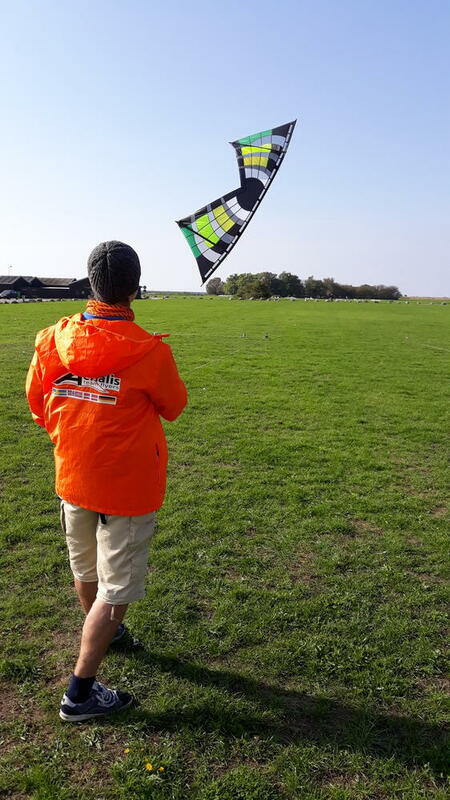 During my first and only group flying event (during the Nordic Kite Meeting) I had the longest line sets in use. My long lines (40kg and 75kg) are 40m long, which corresponds to 131ft, not 120ft. Would this be OK (personally I had no problems with them)? Those maneuvers are extremely dated and simple, some calls details have evolved, but the basic movements required should serve as good practice items. With regard to 40m, I believe that is the international (non US) team standard, it’s close enough to play - the only challenge it presents is during “follow the train” maneuvers where kites with shorter lines are leaving wake or turbulence, through which anything on longer lines will have to fly (like driving a bumpy road). Worst case, it’s easy enough to shorten within a few minutes, which I am happy to personally assist with if it’s agreed to be advantageous. During the last few days, while the memory of the quad clinic is still fresh enough, I’ve been trying to recollect and make the memories of useful bits and pieces of info permanent. The clinic started with a really packed long (2h or 3h?) theory session (mixed with some demonstration of kite parts) that made one’s head explode (from focused listening). 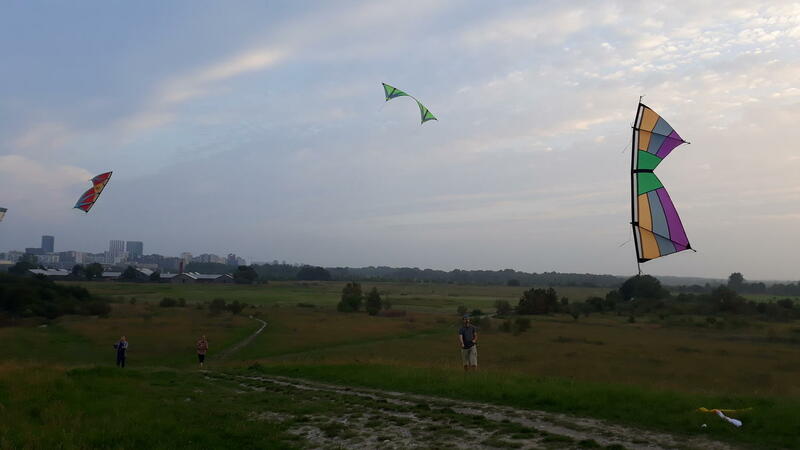 I agree totally in what another participant said: “I’ve never had this much kite theory in such a short time”. Perhaps a 5 min break after 2/3 of the time? Dog stake flying. Learning by ... just doing it (well, i.e. after a demo and a few pieces of advice)! The clinic was beneficial in other ways as well. Getting crucial hints in tricks and turns, getting comments when trying these and getting started on things I not yet had assumed that I would be ready for practising, like flick flack, axel, dog stake training. Something to bring home to the home field is also new figures to add to one’s perhaps too familiar set of things to practice. Rapid sharp turns with preserved speed is really something I’d like to add to my repertoire as well. Also in areas where I thought that there was nothing left to learn I got useful pieces of advice in e.g. things like trimming the brake line length and kite assembly. Even such a basic thing as an LE upwards start could improved/varied. 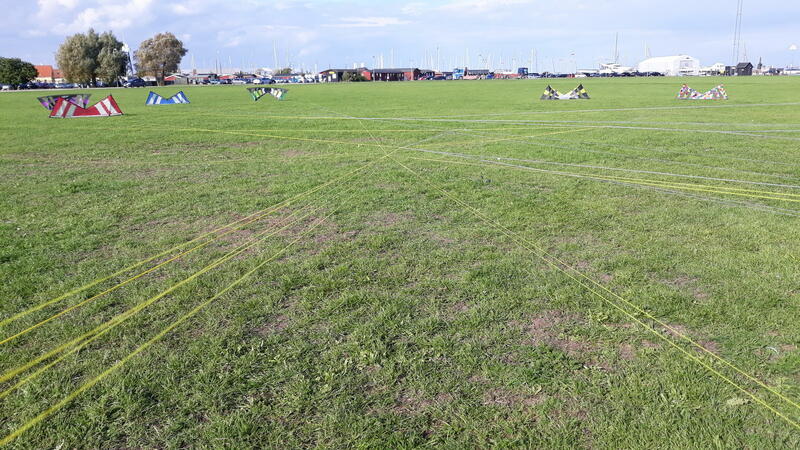 "Networking" the kiting way. An eight line-set “net”. After a few minutes we were all free from the line newly formed net however. Method: everyone moved together and started to undo the twists from the handle side. The group flying sessions were, you guessed it, ... intensive. Trying new things constantly in a just get going style - kind of not only learning by doing. I’d say it even was one step further because the full picture of how the figures should be performed was partly learned after we had started doing them. The two main arrangements of group flying sessions were four and eight persons (including JB). The group sessions was a reminder of even though you could do the figures in your way by yourself (after having understood them at least), the situation is different from that. You don’t chose the pace, can’t hesitate for a moment or cannot chose to use your favourite part of the wind window. The position and speed of your kite should always be matched relative to others. This is a kind of practice that I very rarely get. The evening before the clinic started was nice as well. A personal reflection or a strange sensation: I went to a hill about 500m north of the youth hostel and after an hour the others had arrived and showed up on the hill. Suddenly there were three QLKs being flown, even while my hands were resting (there are no QLK pilots in my area that I know of). Bye to you all and hope to see you the next year! On my wish list for next year there is a nearby (well reasonably nearby anyhow) quad clinic. Perhaps you and your army of small X-mas gnomes and flying reindeers have had everything arranged so that the Denmark quad clinic is already scheduled? I know that the last one wasn’t full (which gave us a super deluxe high concentration of JB’s personal advice). Perhaps one could mention the clinic in German kiting sites to attract more students from nearby? Also, a bit late, I’d like to thank @drdante and @Louise for the related arrangements.